John Stevens has provided the author with copies of price lists published by two manufacturers, the Abbot-Downing and John Stevenson companies. We are most grateful for the use of this material. The Abbot-Downing list is noted as being from their Pattern Book Vol. 9.
inches wider, with an increase of about 100 lbs. without additional cost. 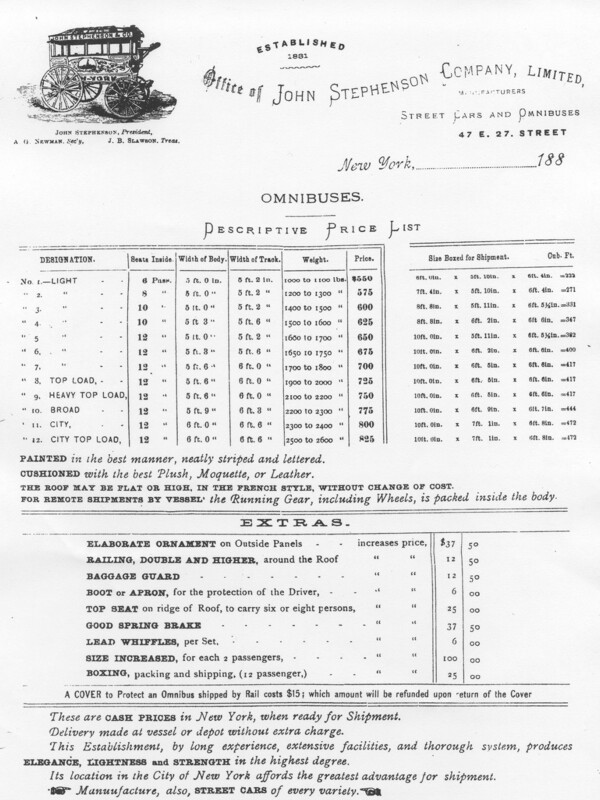 From these sizes upward, the prices increase at the rate of $75 for each two passengers; it being remarked that eighteen inches of room is allowed for each passenger. If the Coaches are fully and elaborately ornamented, $25 extra is charged; also for a good Brake, $25. These are Cash prices in New York, without commission or deductions. The work delivered at the vessel Boxing $15 fir Twelve-Passenger; larger sizes in proportion. Our Omnibuses are used in all parts of the Continent, and adapted to the various kinds of service for which they may be required. Our establishment being in the City of New-York, affords the greatest advantage for shipment at all seasons, and under our own immediate care. The date and prices on this list are handwritten. Unfortunately, the letterhead suffered some damage in copying. Painted in best manner, neatly striped and lettered; Cushioned with the best Plush, Moquette or Leather. THE ROOF MAY BE FLAT, OR HIGH IN THE FRENCH STYLE, WITHOUT CHANGE OF COST. These are Cash Prices in New York. Delivery made at vessel or depot without extra charge. This Establishment, by long experience, extensive facilities, and thorough system, produces ELEGANCE, LIGHTNESS and STRENGTH in the highest degree, adapted to all kinds of service. Its location in the City of New York affords the greatest advantage for shipment. This is an actual image of the printed price list. The base prices of the various models are the same as in 1871, but some of the “Extras” are priced differently. Note also the last line, advertising the manufacture of streetcars, i.e., horsecars. The business was changing. Also, J. B. Slawson, now resident in New York City, is listed as Treasurer of the firm. He died in 1886, so this price list must have been issued earlier in the 1880s.